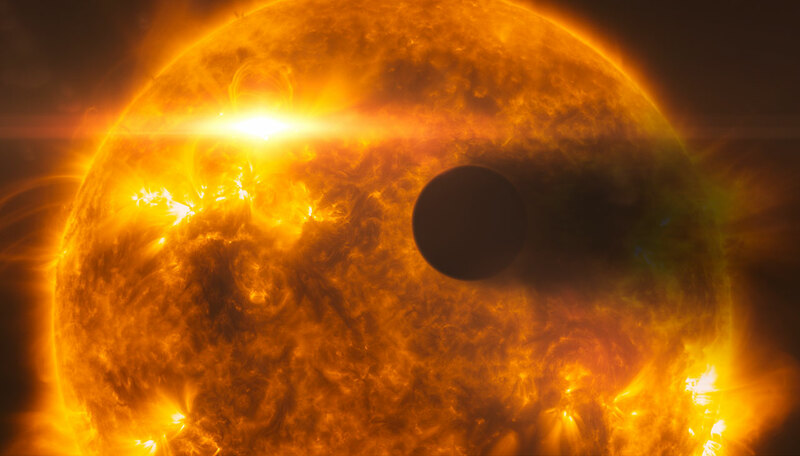 This artist’s impression shows exoplanet HD 189733b, as it passes in front of its parent star, called HD 189733A. Hubble’s instruments observed the system in 2010, and in 2011 following a large flare from the star (depicted in the image). Following the flare, Hubble observed the planet’s atmosphere evaporating at a rate of over 1000 tonnes per second. In this picture, the surface of the star, which is around 80% the mass of the Sun, is based on observations of the Sun from the Solar Dynamics Observatory.